I just couldn't get motivated to work on an UFO so I started a new quilt...one of the kits I bought in Atlanta, "Tonga Escape." The pattern is set up to be a block of the month...instead I purchased it as a complete kit. The pattern has six sampler blocks that are made twice. I got all the blocks cut out today but decided I should really sew some of these little pieces together before I put any more stuff on the design wall. I'm wondering if the person who put my kit together made a mistake...I have a lot of excess fabric for the blocks. There is another bundle of fabrics for the borders. I'm thrilled I have excess and not the other way around! I finished another Bucilla stocking kit, "Football Santa." I just can't say it often enough with these kits...they are so gosh darn cute!!! That's why I am addicted to making them. I've gotten great tips from other Bucilla enthusiasts on my Facebook page devoted to construction of these kits. I added a backing felt piece to all the leaves in this kit which was not the original design. I really like this idea that others gave me! I also backed the scarf on Frosty. It sure makes the felt piece much more sturdy that is hanging off the edge. I almost passed up making the pompom too but so glad I made the extra effort. Just like the EQ drawing. The borders went on like a charm. It feels so good when it all works out as planned. The final size is 60 x 76 inches. 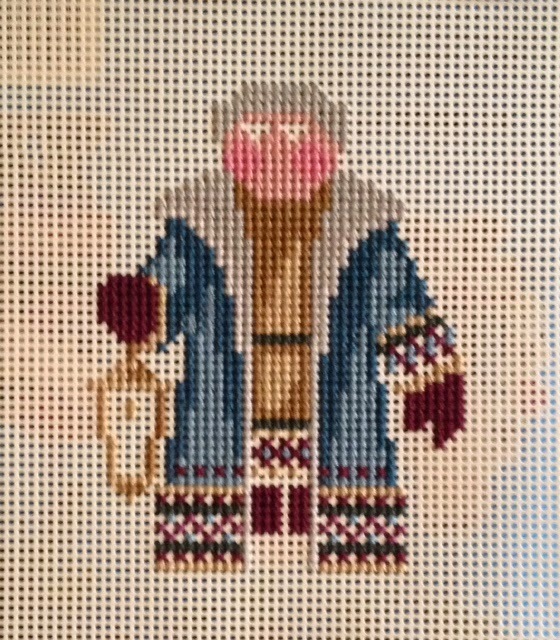 Finished up my latest cross stitch ornament, Grandfather Frost. And I even worked on my stocking project...getting to the final steps on this one. My husband is going on a trip tomorrow and will be gone for a week. Trying to decided what quilt project to tackle. If I wanted to be a good girl, I would work on one of my UFOs. I think I have four officially in progress in my Paris sewing room. I only have two months left until I head back to Alaska. Thank you! I love all the input I got on my border dilemma. I took Carol's advice from The Polka Dot Chicken and worked on something entirely different...a cross stitch ornament. While my mind wandered...I decided the little pinwheels where just not relating to the main pattern like I had envisioned so I got rid of them. I also had very little background fabric to work with which meant a smaller border. I just finished cutting out fabrics for the remaining pieces. I have one, 2 1/2-inch strip of the background fabric left after cutting all the border pieces. What a relief! It is always a challenge to figure out how to get my ideas to work with the EQ program. I did not cut a ton of 2 1/2-inch squares to make the border pieces...I just had to draw it that way to make it work in EQ...the border portion of the program is a bit limiting on what you can introduce. I really need to learn how to use the custom quilt portion of the EQ program. Can't beat the ability to use the actual fabrics in the layout. I bought one of EQ's stash programs that was all batiks from last year to add to the programs fabric library. I can get JPEG images of all the Moda fabrics from the Moda website. I wish all the fabric manufacturers offered the images to download. I have this flimsy done. I have these pieces left over from this top and another done in this fabric colorway. It screams out at me that I need to make borders. Time wasted spent on EQ7...two border options I am considering. I'm also thinking about dropping the little pinwheels all together in the second option. I don't have a lot of the background light blue fabric to play with so I may be more limited than I think. Heavy Sigh.....time to work on something else for a while. I could be done with Café Paris but I have quite a bit of fabric left in the form of strips and charms which just may have to become a border. I'm going to play with the idea a little bit. The current size is 48 x 64 inches so it could stand a border or two. I really enjoyed this pattern which is made with a layer cake and some background fabric. Always a stocking in progress. Finished a cross stitch ornament I started in Atlanta. Black Forest Santa. Love the cardinal! but lots of batiks in my earthy color range on the inside. A great selection of quilting books...most were very new and ones I had not seen. Oodles of patterns...also many by designers new to me. Lots of printed cottons. This old house has several small rooms full of different fabrics. There were a few rooms I missed in getting photos. My phone was almost dead because this quilt shop was an unexpected visit. It is in Kennesaw and we were in the area to visit a Hobby Lobby when my friend remembered there was a quilt shop in Kennesaw...so glad we checked it out! I really should take notes on these shop visits. I loved this quilt below but no pattern...it is either the shop hop quilt or their Saturday Sampler. I bought the pattern for this quilt....sure wish they had a kit for it! This pattern is called Southern Hospitality by Deb Tucker...not familiar with her but I will be after I make her quilt pattern. And I bought the pattern for this quilt...only five fabrics...perfect for busting a stash. Here's my little stash...I know...I showed an amazing restraint in my three fabric and two pattern purchases...I was on the edge going crazy! I now have a fabric stash in Atlanta as I left some of my fabric purchases on a closet shelf at my friend's house. She'll ship them to me in Alaska when I get back there this summer. No sense in dragging them to Paris when I know they go with fabrics in my Alaska stash. This is one of the brightest quilt shops I have ever seen. Walk through these doors on a day you are feeling blue and I think you can't help but come out smiling. This curvy quilt was made with the curved template at the bottom of this photo...major cute but I already have the "Curve It Up," ruler. The blue quilt on the right is a shop original. Another shop original quilt...designed by Taffy McLaughlin...only available when purchasing the 48, 10-inch squares needed to make the patchwork blocks. Got it! Another shop original design, Dry Heat. I also bought the kit for this! So much batiky eye candy...I was in heaven. Of course...a shop with so much bright color would have Kaffe Fassett fabrics and similar prints. I showed a tiny bit of restraint and didn't buy this kit...Ripple Effect. One last photo... a bit blurry. There were lots of modern prints...sorry no photos. The shop was featured in a 2009 Issue of Quilt Sampler...their shop quilt is on the cover. And a little odd find...peppermint candy buttons. I can't tell you how long I looked for some of these in this size for a Christmas stocking project many years ago...finally got them! This shop is officially in Decatur but for a non-local...feels like it is just part of the Atlanta sprawl. Today is my first full day back in Paris...home sweet home. I had so much fun on my trip back to the U.S., but it sounds like I got out of there just in time. Snow and ice all along the east coast. It is pretty temperate in Paris. I got to visit three more quilt shops in the Atlanta area before I left and the last three were fabulous! Tiny Stitches is a gorgeous shop with wonderful large windows that bring in tons of great natural light. I did not do this shop justice with my photos...I was in fabric overload. I bought this Tonga Sampler kit, Tonga Escape by Cozy Quilts. The sun was shining brightly behind it so it was tough to get a photo..but I loved everything about this design. Part of the batiks section. I wanted to buy a kit of this quilt too but it is the shop's Saturday Sampler so they didn't have it kitted up to buy in one package. I am always drawn to samplers. And then this fun quilt really caught my eye, snowboarders! I should have written down the name of this pattern. Such an adorable line of fabrics. This shop had such a great selection of fabrics that would appeal to a wide range of quilters...don't miss it if you are in the Atlanta area. The batiks were just a small part of the quilt shop's fabric selection...you know me...monovision when it comes to batik fabrics. Here's what I bought...the Tonga Escape kit...see all those blue and brown batiks! Probably my favorite colorway. Two magazines for airplane travel and a set of 12 batik fat quarters in an autumn colorway...leftover from the shop's last Saturday Sampler...sew pretty! Here is my purchase from Little Quilts. Two Jinny Beyer Batiks...they will make great backgrounds. And my first quilt shop purchase of the trip at Red Hen Fabrics. They gave me the cat scissors as a gift! Three Robert Kaufman batiks to add to the stash. Their batiks were less expensive than all the other shops I visited in the Atlanta area. Two more shops to share...later! We had a fun adventure yesterday, visiting the Scott Antique Markets, which are held the second weekend of every month. Two giant warehouses full of old and new products. Several booths with porcelain and glassware. And outside there were more collections to view. I might have to get some of these glass fishing bouys someday. Good thing I have a resource person to contact in Atlanta. An outdoor area with vendors. There was a salvage yard. This moose wouldn't fit in my suitcase. This was our spectacular find. My friend is an interior designer and we both loved these floor lamps from the 70's era. Both are in perfect working condition and all of the glass lenses were perfect. the cost was $200 for the pair and my friend is going to change the brass/gold finish to a silver. I know they will look spectacular and I can't wait to see the "after" photo.